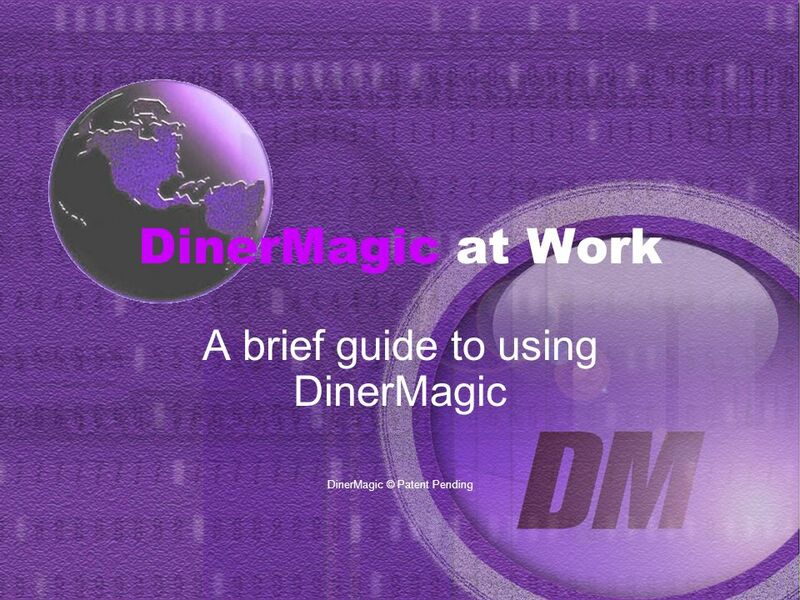 DinerMagic at Work A brief guide to using DinerMagic DinerMagic © Patent Pending. 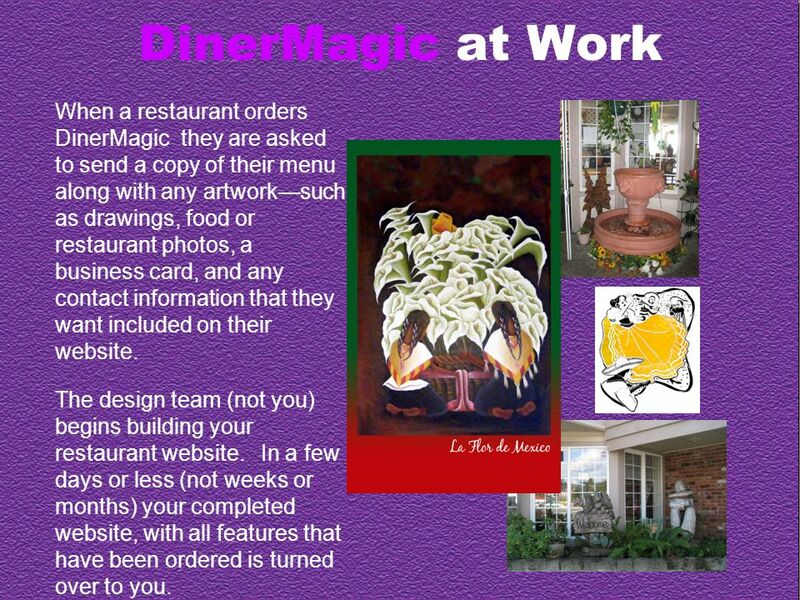 3 DinerMagic at Work When a restaurant orders DinerMagic they are asked to send a copy of their menu along with any artworksuch as drawings, food or restaurant photos, a business card, and any contact information that they want included on their website. The design team (not you) begins building your restaurant website. In a few days or less (not weeks or months) your completed website, with all features that have been ordered is turned over to you. 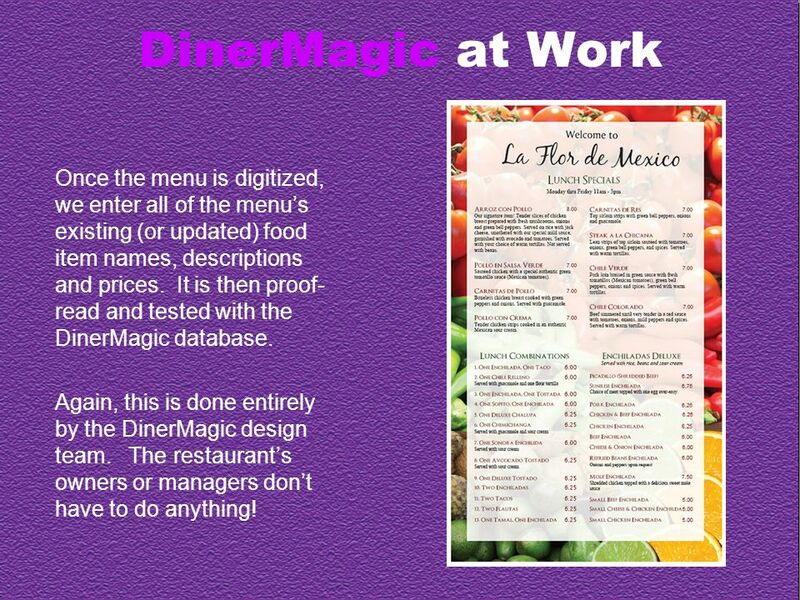 5 DinerMagic at Work Once the menu is digitized, we enter all of the menus existing (or updated) food item names, descriptions and prices. 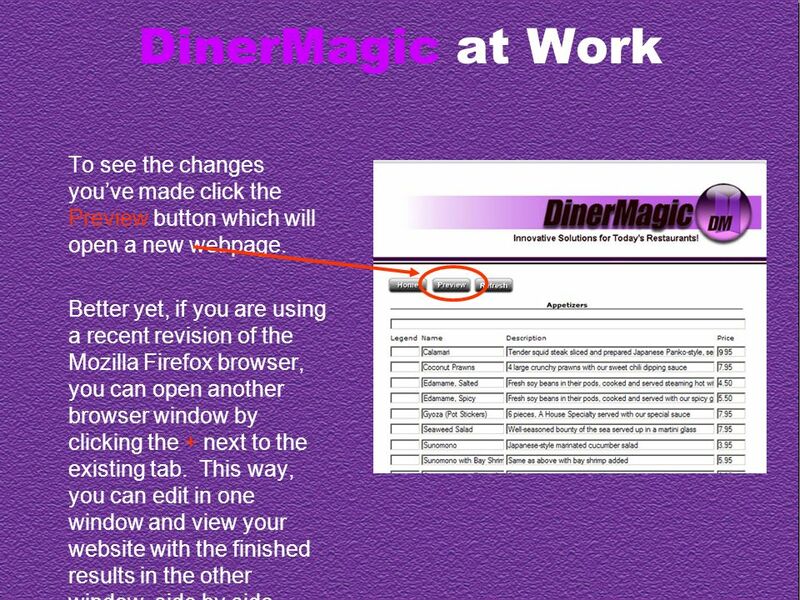 It is then proof- read and tested with the DinerMagic database. Again, this is done entirely by the DinerMagic design team. The restaurants owners or managers dont have to do anything! 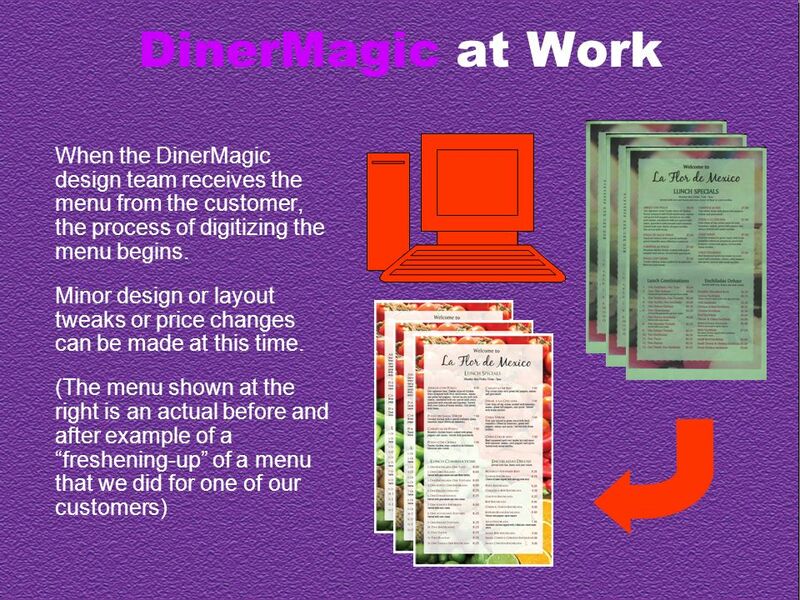 6 DinerMagic at Work Once your menu design is finished, it is uploaded to your website and the website goes online. You will now have access your website and the Admin Control Panel where you can begin management of your website. What can you do? 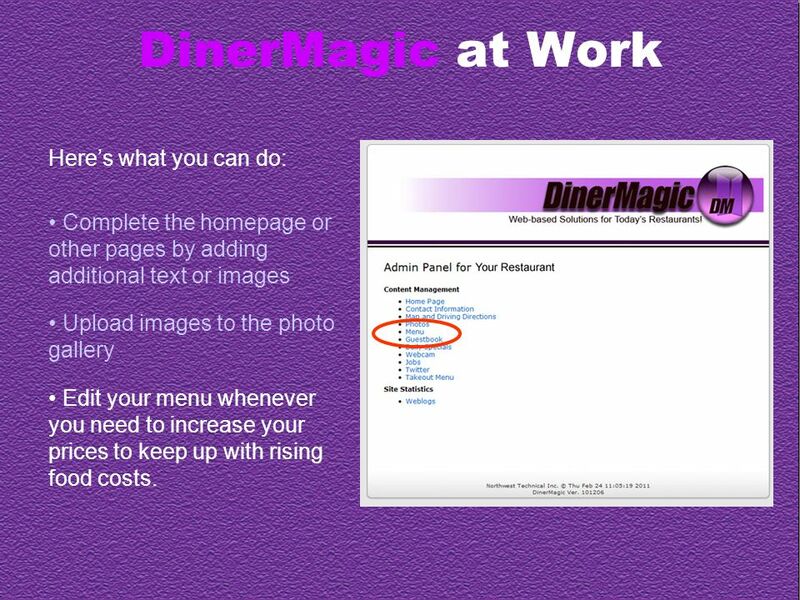 9 DinerMagic at Work Heres what you can do: Complete the homepage or other pages by adding additional text or images Upload images to the photo gallery Edit your menu whenever you need to increase your prices to keep up with rising food costs. 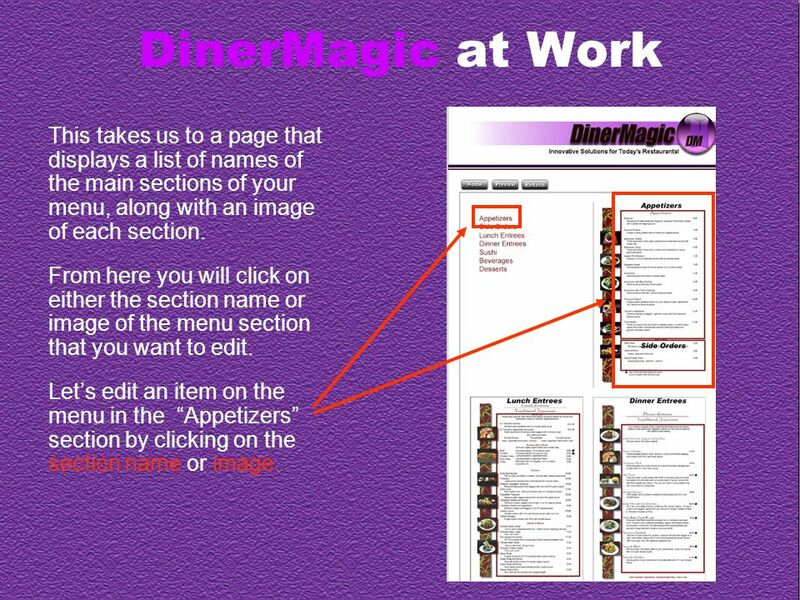 12 DinerMagic at Work This takes us to a page that displays a list of names of the main sections of your menu, along with an image of each section. From here you will click on either the section name or image of the menu section that you want to edit. Lets edit an item on the menu in the Appetizers section by clicking on the section name or image. 13 DinerMagic at Work This is the Appetizers edit page. Lets change the price of Calamari. Simply place the cursor in the Price field for that item. Delete the old price with the Backspace key or Delete key. Then simply enter the new price. 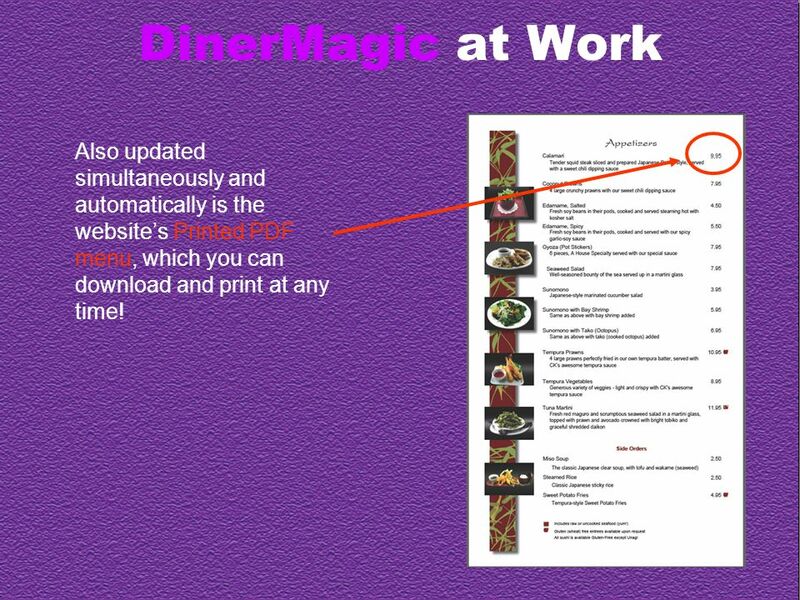 14 DinerMagic at Work Then scroll to the bottom of the page and click Update. This will simultaneously update the restaurants: (1) Online menu (2) Printed PDF menu (3) Takeout menu (if you have one) You only edit once, and all three menus are automatically & simultaneously updated! 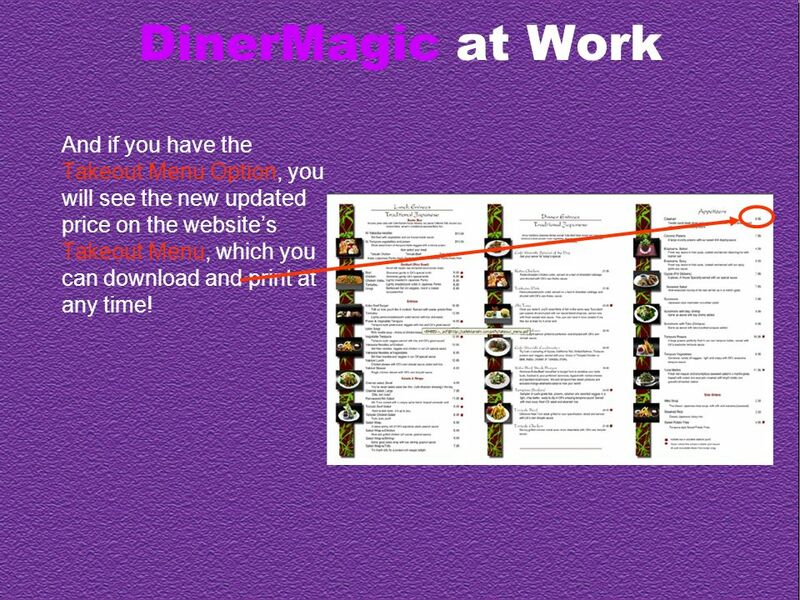 15 DinerMagic at Work To see the changes youve made click the Preview button which will open a new webpage. Better yet, if you are using a recent revision of the Mozilla Firefox browser, you can open another browser window by clicking the + next to the existing tab. This way, you can edit in one window and view your website with the finished results in the other window, side by side. 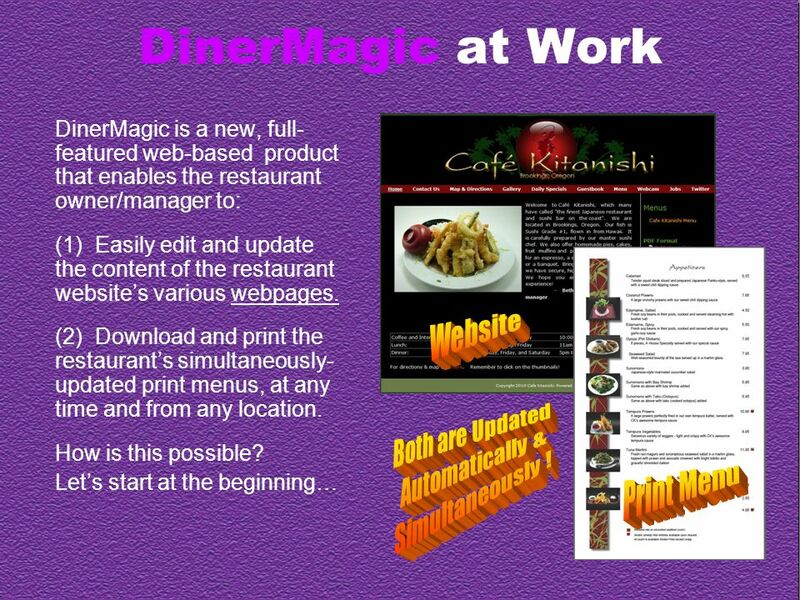 17 DinerMagic at Work Also updated simultaneously and automatically is the websites Printed PDF menu, which you can download and print at any time! 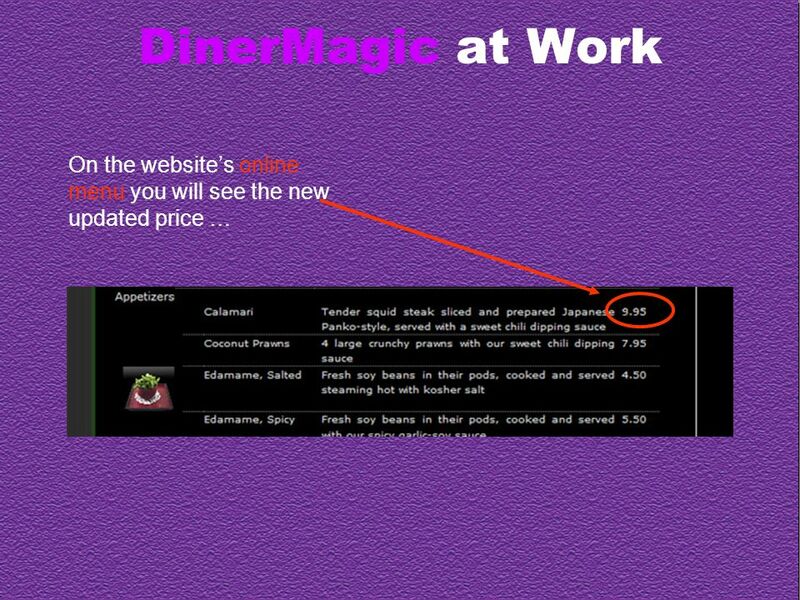 18 DinerMagic at Work And if you have the Takeout Menu Option, you will see the new updated price on the websites Takeout Menu, which you can download and print at any time! 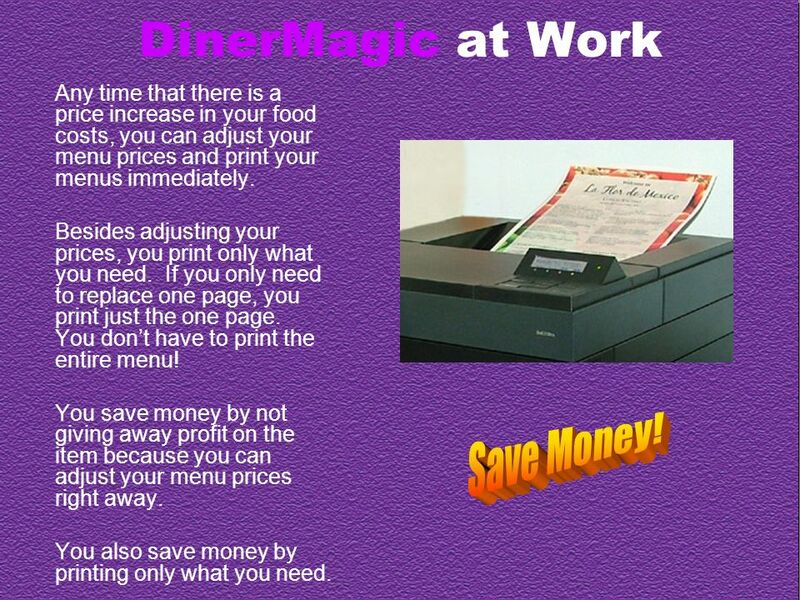 19 DinerMagic at Work Any time that there is a price increase in your food costs, you can adjust your menu prices and print your menus immediately. Besides adjusting your prices, you print only what you need. If you only need to replace one page, you print just the one page. You dont have to print the entire menu! You save money by not giving away profit on the item because you can adjust your menu prices right away. You also save money by printing only what you need. 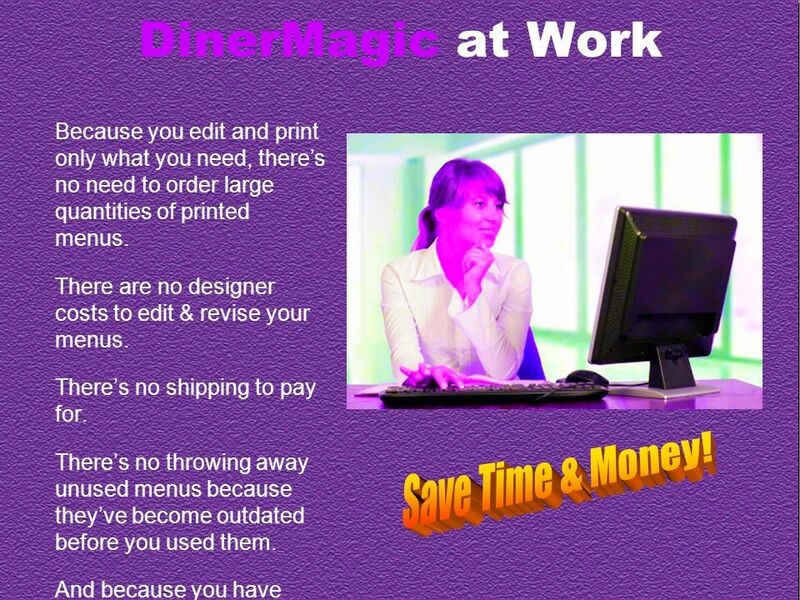 20 DinerMagic at Work Because you edit and print only what you need, theres no need to order large quantities of printed menus. There are no designer costs to edit & revise your menus. Theres no shipping to pay for. Theres no throwing away unused menus because theyve become outdated before you used them. And because you have menus instantly, theres no waiting. 21 DinerMagic at Work Imagine. No more waiting for updated menus to arrive! You can make edits to your menu and have the new menus ready in a few minutesnot 3 or 6 weeks from now. You can have them today to give to your guests during your next lunch or dinner shift! 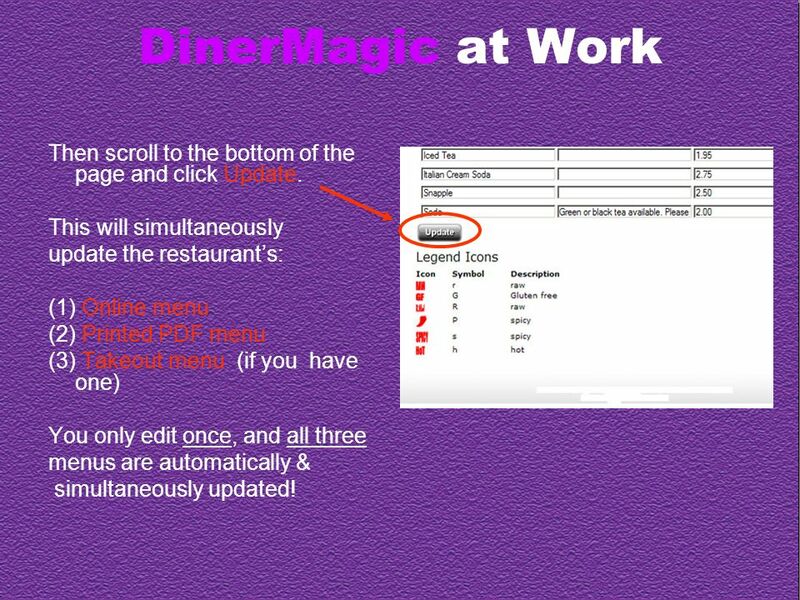 22 DinerMagic at Work Besides editing prices and descriptions, you have the ability to move items on the menu, or remove an item altogether. One reason to move an item is to highlight more profitable items and lower the visibility on lesser profit items. And if an item isnt making you a reasonable profitno matter how popular it isits time for it to go. You cannot stay in business if you give food away at your cost. You need to be able to easily and quickly adjust your prices to ensure you offer them at a reasonable profit. 23 DinerMagic at Work Lets edit another page. Looking at the website homepage on the right, we can see that theres not very much information on the home page. There should be. After all, this is the first thing visitors will see when they visit your site. This is where you tell the world who you are, what you do, and how you do it! Notice that the hours of operation for the restaurant are missing. Lets add them. 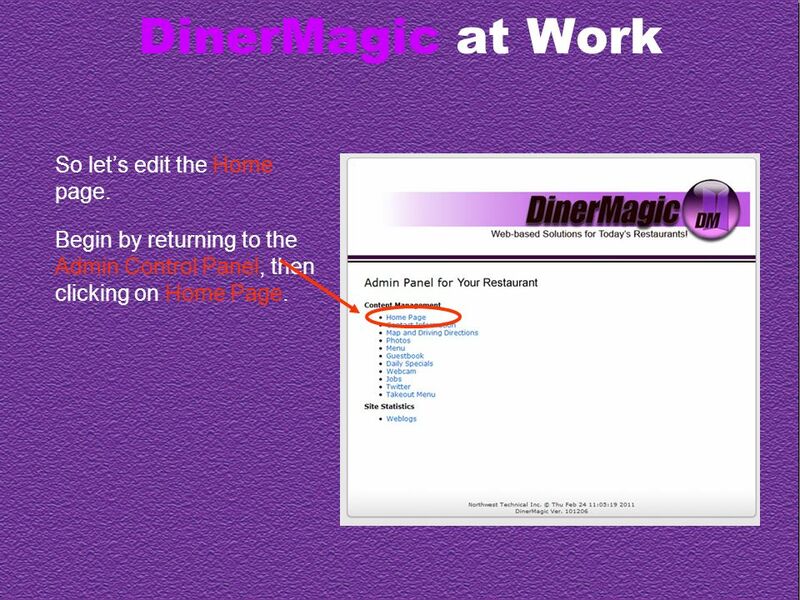 24 DinerMagic at Work So lets edit the Home page. Begin by returning to the Admin Control Panel, then clicking on Home Page. 25 DinerMagic at Work This takes us to our Home Page Editor. Youll notice that it looks pretty much like any text editor used in a word processor or even many email programs. Lets add the hours of operation to the existing text. We begin by placing our cursor in the text area below the existing text and clicking once. 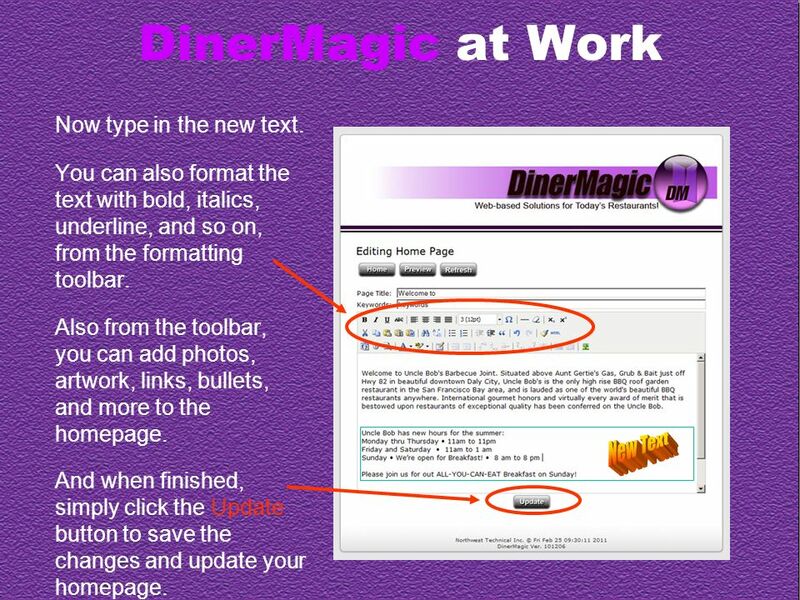 26 DinerMagic at Work Now type in the new text. You can also format the text with bold, italics, underline, and so on, from the formatting toolbar. Also from the toolbar, you can add photos, artwork, links, bullets, and more to the homepage. And when finished, simply click the Update button to save the changes and update your homepage. 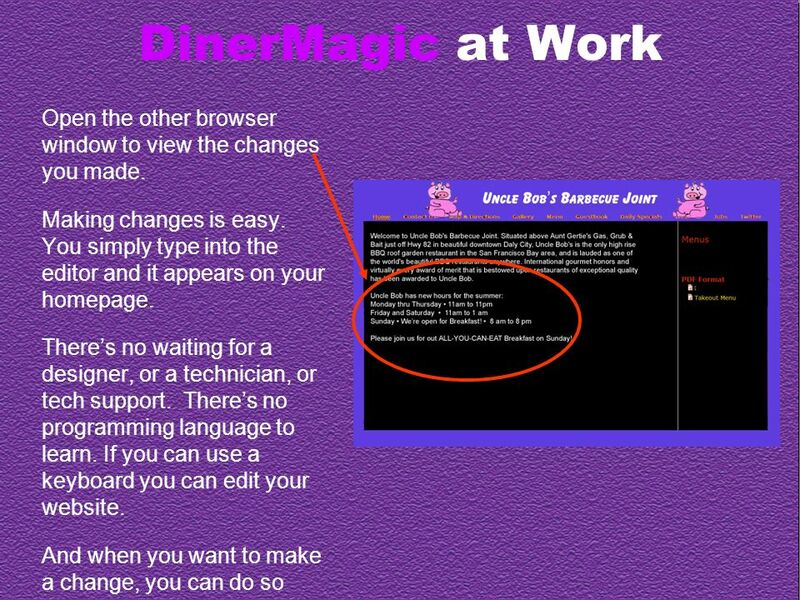 27 DinerMagic at Work Open the other browser window to view the changes you made. Making changes is easy. You simply type into the editor and it appears on your homepage. Theres no waiting for a designer, or a technician, or tech support. Theres no programming language to learn. If you can use a keyboard you can edit your website. And when you want to make a change, you can do so yourself, at any time and any place that you have Internet access. 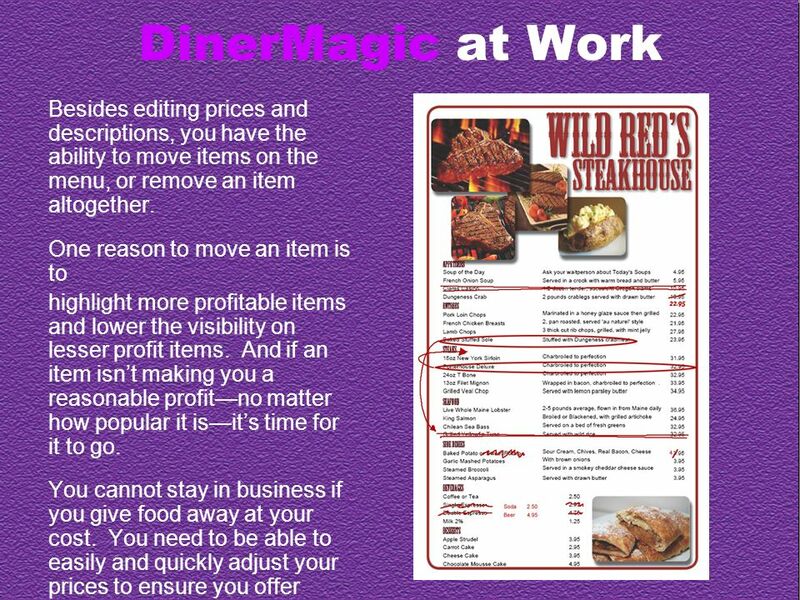 29 DinerMagic at Work Here are some other scenarios: Say you need to move some perishables that you overbought. Instead of grinding up that expensive tenderloin for hamburger, why not Tweet your customers and offer a special? Be smart! Instead of losing money, you can make more money! For special events would you like to be able to announce that you can offer catering services and accommodate large groups? Need to let your customers know you will be closed unexpectedly, but dont want them to be upset? With DinerMagic, you can do all of this yourself immediately. If you do, you will make lots of money! Uncle Bobs has the biggest burgers in town! 20% Discount for Players wearing their jerseys! Free meals for team bus drivers and coaches! Celebrate in our Big Piggy Banquet Room! We can seat over 200 guests! 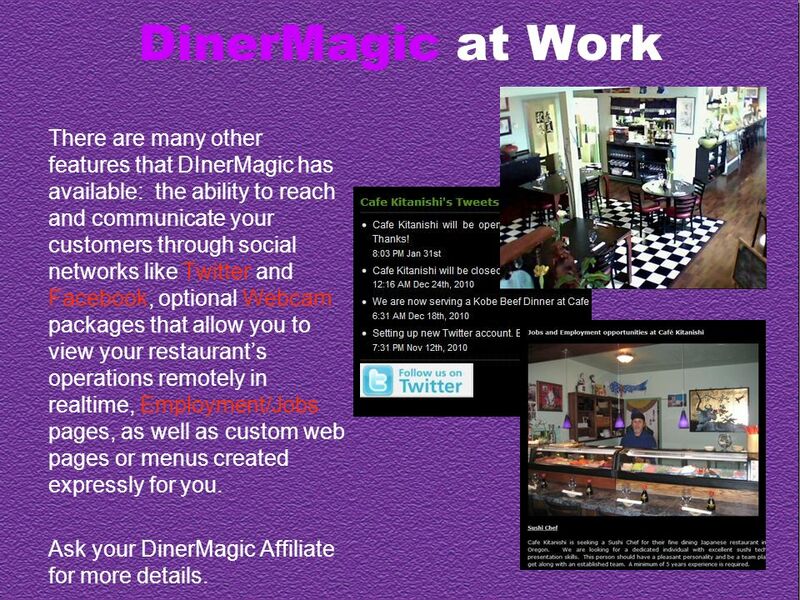 30 DinerMagic at Work There are many other features that DInerMagic has available: the ability to reach and communicate your customers through social networks like Twitter and Facebook, optional Webcam packages that allow you to view your restaurants operations remotely in realtime, Employment/Jobs pages, as well as custom web pages or menus created expressly for you. Ask your DinerMagic Affiliate for more details. 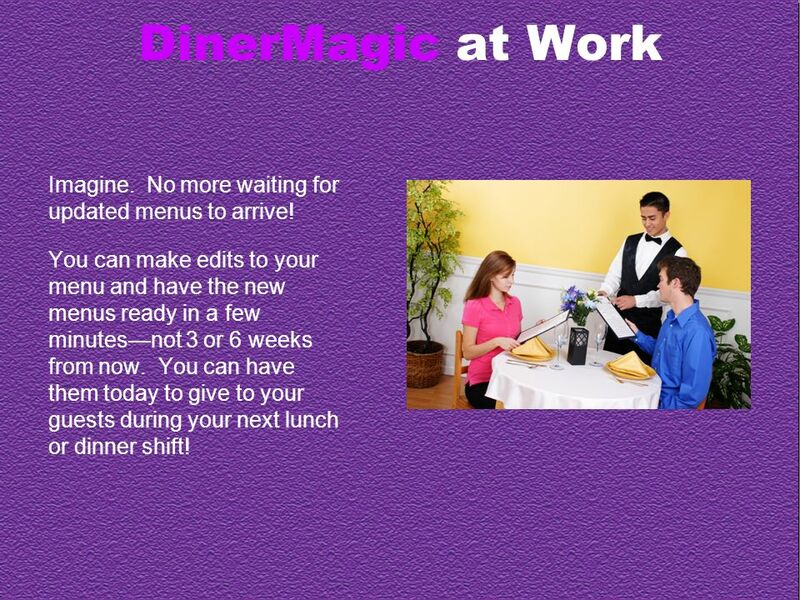 31 DinerMagic at Work As restaurant owners, we at DinerMagic know that owners and managers are very busy people and that time to learn to use new tools can be difficult to come by. We also know that technology can be somewhat intimidating. Maybe thats why some of our customers hire their 12-year olds to help them. 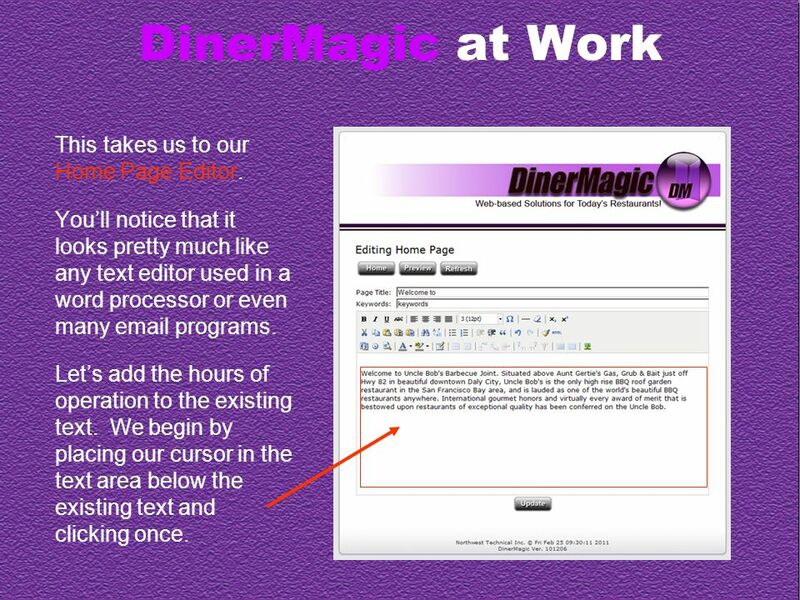 But editing the DinerMagic website, including web pages and menus, is as easy as sending email, with no special skills needed. Like any new tool there is a small period of familiarization involved. 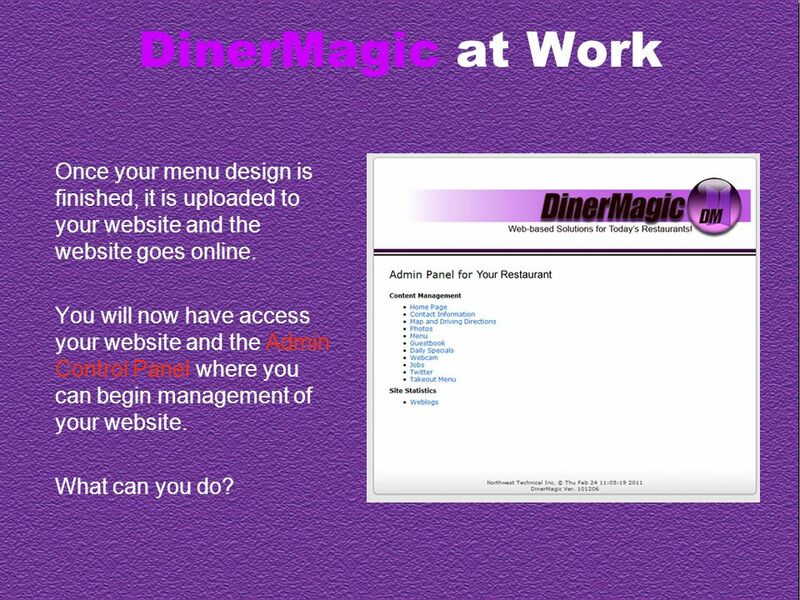 But once that initial learning curve has been passed, DinerMagic will save your restaurant countless hours and dollars, and will continue to do so in the future. Especially in these times of skyrocketing food costs, only those restaurants that can adjust their menu prices quickly will survive. Remember, if you do need help, we are just an phone call or an email away. 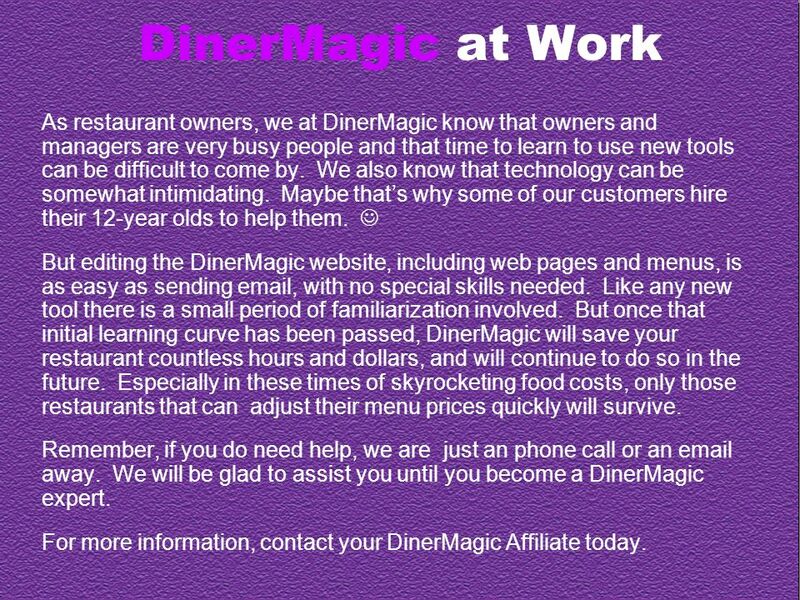 We will be glad to assist you until you become a DinerMagic expert. 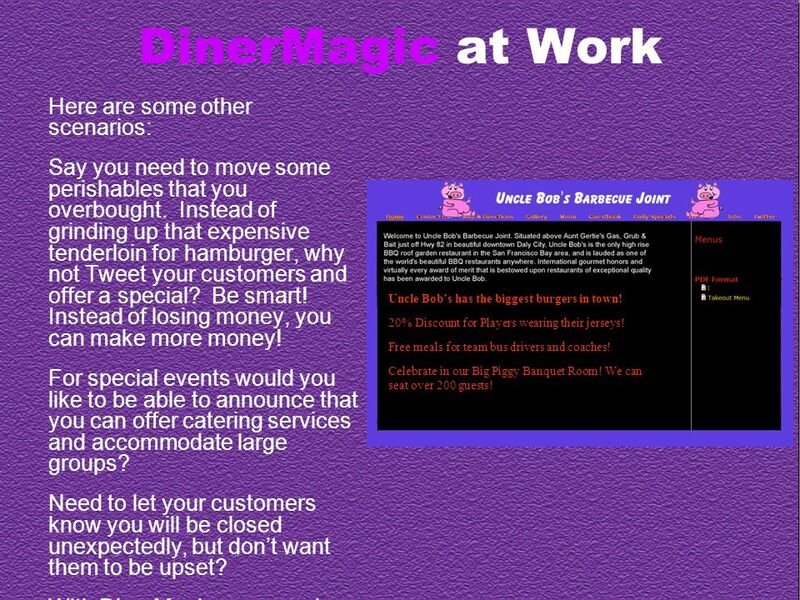 For more information, contact your DinerMagic Affiliate today. 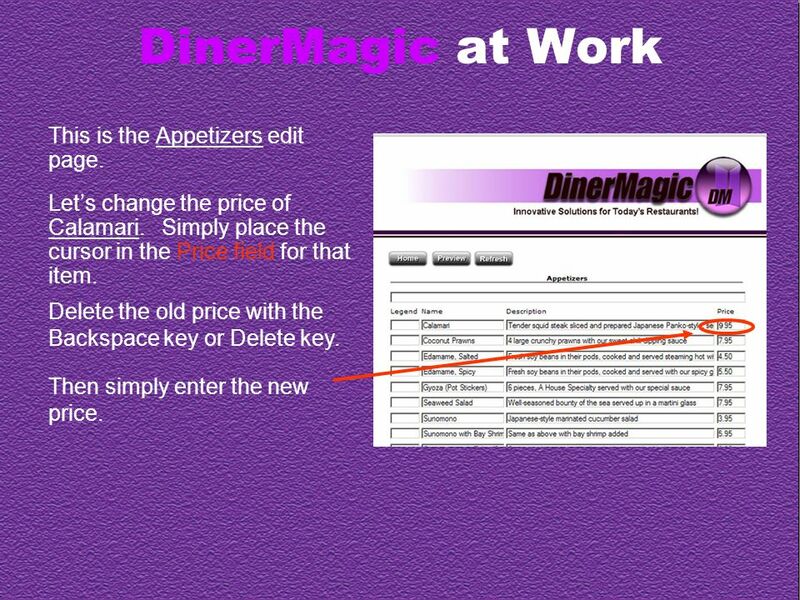 Download ppt "DinerMagic at Work A brief guide to using DinerMagic DinerMagic © Patent Pending." 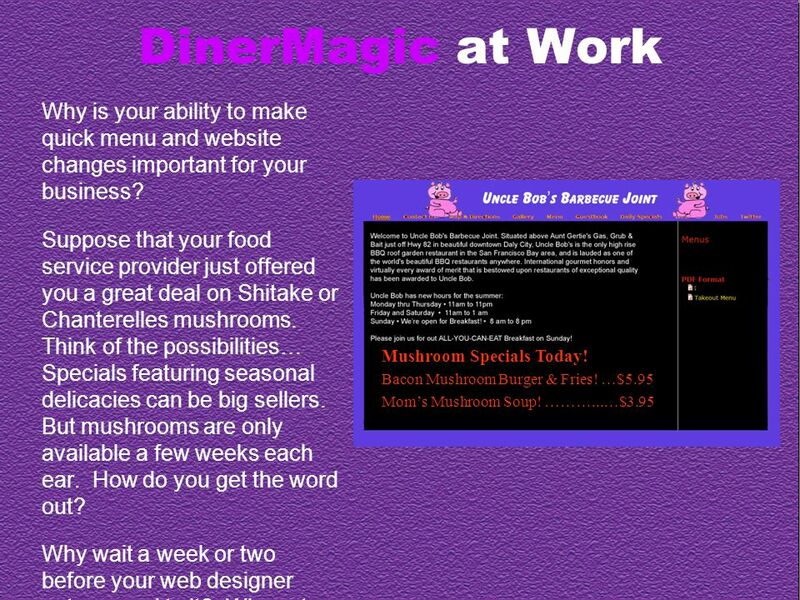 DinerMagic Innovative Solutions for Todays Restaurants! DinerMagic © Patent Pending. Editorial roles Members of a Manila site can be assigned an editorial role if you want to grant them access to write stories or modify the appearance of. AWARD RECIPIENTS REGISTRATION INSTRUCTIONS February 5-7, 2015. An Introduction to ChapterWeb 2.0. Logging In Use your same username/password to login. Once your website has been converted to ChapterWeb 2.0 you’ll. Exit Microsoft Outlook Skills Using Categories for Sorting, Filtering and Creating Group Oklahoma Department of Corrections Training Administration. Web Content Management System Website Maintenance Demonstration Introduction to Macromedia Contribute Jamie Uprichard. Objectives Moodle is an online learning environment where instructors & their students interact. In this workshop you will learn: 1.Configure system requirements. Welcome to the Turnitin.com Instructor Quickstart Tutorial ! This brief tour will take you through the basic steps teachers and students new to Turnitin.com. Click your mouse button to advance the frames.. Coaches/Team Moms Getting Started. New School Websites Teacher Pages. Visit the SCUSD Website for videos tutorials: For more information. Review of last session The Weebly Dashboard The Weebly Dashboard Controls your account and your sites Controls your account and your sites From here you. Creating a Web Page HTML, FrontPage, Word, Composer. November 3, 2011 Deborah de Bruin Building Digital Libraries. A detailed guide on how to set-up your printing storefront. Please Note: Storefronts are compatible with all browsers, however for optimal use of the admin.